Deutsche Bank announced co-CEO Christian Sewing would takeover as chief executive, effective immediately. Shares of the firm rose, but the new boss will face tough questions over the bank’s future. You can track Deutsche Bank’s stock price in real time here. 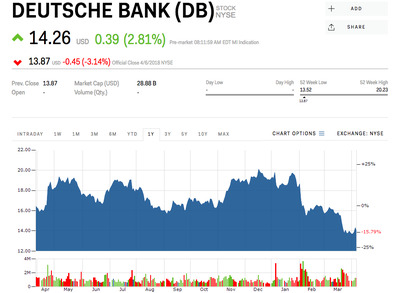 Shares of Deutsche Bank rose as much as 3.4% in early trading Monday after the firm on Sunday announced Christian Sewing will replace CEO John Cryan, effective immediately. Sewing, previously the deputy CEO and head of retail banking, will take over at the bank as its key shareholders debate how to remedy falling revenues and defecting staff in its investment banking division. Deutsche Bank’s stock price has fallen 15.8% in the past year amid downgrades by sell-side analysts on both sides of the Atlantic. Only five of 34 analysts surveyed by Bloomberg have a “buy” rating for the stock, with an average target price of $US15 -a 7% premium to Monday’s prices. “Without a clear strategy commitment by all parties, turning Deutsche Bank around will be difficult,” JPMorgan analyst Kian Abouhossein said in a note to clients Monday, according to Bloomberg News.